BICC Public Event, Manchester- The Bellot Collection. Public event, 12th February 3-5pm. Born in Manchester (1806), Thomas Bellot served in the Royal Navy as a surgeon during and after the first Opium War in China. He acquired a collection of Chinese bronzes, coins, books and manuscripts which are now deposited in the Manchester Museum, Manchester City Library and the John Rylands Library. 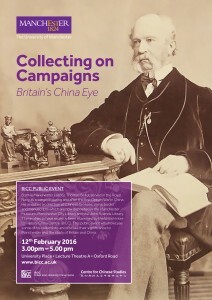 These objects have recently been examined by the British Inter- University China Centre (BICC). This public event will showcase some of his collections and discuss their significance to Manchester and the study of Britain and China.